With 2.1 Flame totem got an early game nerf as well as well as a lategame nerf. Expect to lose about 20% damage at least. This doesnt break the build but is annoying considering GGG explicitly mentioned that Flame totem will do more daamge at gem level 22+.I am very unhappy about this failure of either communication or number adjustment but we will have to live with this now. I havent had the chance to test a full chaos version nor to try controlled destruction so feel free to experiment with them. With 2.0 There have been severe changes to shotgunning spells like Flame Totem and with the Chaos of the Expansion itself it seemed that Players lost Track of what builds are decent and how to evaluate different builds. Since the Launch of Tempest/Warbands Totem builds were again popular because of the hard content that act 4 and Maps provided, while also giving the Option to either use them for MF, or simply to use them as catapults to propell yourself into more expensive builds later on, as Totem builds tend to be rather cheap (at least in the beginning). The Purpose of this guide is to highlight the Power Of Flame Totems in 2.0 for HC and SC and give a small comparison to Incinerate Totems which have also become very popular and give the Player a way to gauge for themselves what build they prefer due to the strengths and weaknessess both skills provide. As the 1 Month League is coming nearer and having the Tempest league as a playground to Test and assert the power of Flame totems I feel that now is a good time to present my Findings to the community. Naturally this Guide will focus more on Flame Totem to cover as many Variations and Questions as possible. - While cheap to start, it has a High scaling with even better gear later on. The Limit is the sky. - Has a secondary defense layer with Three Dragons and added lightning of Freezing and shattering in addition to shocking. Porcupines hat him! - While access to roughly up to 8k Effective HP on the HC Version of this build, you still dont have much mitigation beyond that. Careless play can be dangerous. - You are rely on your health potions to sustain a fast rhythm of playing totems, therefor content above your capabilities aswell as non-regen/reflect/desecrate maps become annoying and dangerous to play if you come unprepared. - The Aoe Coverage isnt exactly the best. This is improvable through correct totem placement but noticable nontheless. In Comparison to Incinerate totems, Flame totems have it worse. - While In the SC version of this Build Uber Atziri is certainly doable, doing it Deathless poses a Challange that cant be overcome in every run. So its NOT a good choice to go flame totems on HC for Uber specificly and honestly probably not even for SC as the Gear threshhold to aquire seems to me atleast, is higher then your usual PA/TS/SRS Build. I recommend for both SC and HC to start as a witch. Templar is also possible but falls short by roughly 2% increased damage of 1 Node. Does it really matter on the long run? Not really. But why cutting yourself short on power if its not neccesary, right? Not exactly what you looking for but the Base and roll give you an idea! What you want is a 3link Quartz scepter with +1 fire gems which can be a blue item for what its worth. This is Craftable yourself. Look out for a 3linked Red-Blue-Blue Quartz scepter of magic or white rarity, make it magic and then use the Vendor Recipe of selling it with 1 alt and one ruby ring to get a +1 fire Gem scepter. 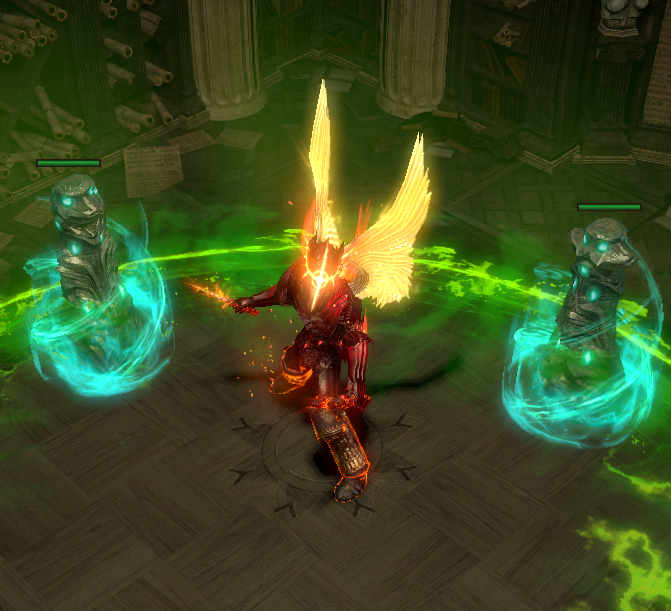 This Scepter will have your basic link of Flame totem-Faster Casting- Added lightning and hold strong for a long time. If neccesary up until merciless but in the best case you want to switch to decent wands and a 4link in which you can incorporate Fire penetration as soon as possible. Dont mind the Corruption, the base Item is what you want. Dexterity is very usefull for Flame totems as you will use a Faster Projectile gem and assasins mark at some point and move speed together with 30% proj speed is basically a godsend. Projectile speed is very hard to come by in fresh leagues so paying 1 Chaos for this is not only worth it, this will actually usable till you aquire a 5link+. At this Point you will have the basic cheap items to provide you on your leveling Journey. Naturally while leveling you wont feel really the "Crit" part of this build to much, nontheless it will become noticable during the next part of the build progression. Follow Up Tree - Order in which you aquire the nodes is up to you, some prefer rushing bloodmagic, while others like to grab the life and damage on the way first. At some Point during this time you will make use of your respecc points and reroute a little. At this Point we are finishing the "Leveling" part of the Guide. The Following part will elaborate on the Next core items aswell as the differences in passives / gear choices when it comes to HC or SC. Dont Forget to cap your resists as good as you can while leveling! How To Progress and gear once you (almost) reach the end of merciless. For the next part of Gearing up, depending on the "freshness" of the league there are 2 Situations possible. Dont mind the corruptions nor the links. an Infernal mantle to push your damage and crit chance even further (4linked is abolutely fine) and a pair of Facebreakers if your Resists allow it. The Facebreakers should be rolled with low physical damage, as those will be the cheapest. At some point you might switch them to Maligaros Virtuosity but thats still in the future and right now you care to fix your basic settup. Those will be a substitute for infernal Mantle or a Trading token/selling Object to aquire an Infernal Mantle. With an infernal mantle aquired we can now jump into the passives again to highlight the next important step for HC players, and the generall speccing points further for SC and HC players. Mind over Matter aswell as Eldritch Battery. What at first seems questionable will be your way to actually higher HP later on. At this point you hopefully will have aquired an infernal Mantle which provides up to 1k ES just by itself. In addition to maybe some ES shoes and an ES Shield at some point you will roughly gain 1500 to up to 2000 ES in later stages of the game. Using a Potion will put you at 6k Life and 0 ES which will only regen if you exit the fight without casting. EB+ MOM allows therefor a higher average EHP by removing only 30% ES per hit and therefore recharge it infight at meaningfull levels. I personally find this type of Defense very strong and superior to a hyrbid ES+Life approach. You will notice that now we have most easily accessable jewels allocated and grabed some extra life here and there. The order is up to you and how jewels are available. 7% life and 2 Dmg mod jewels are very potent and worth getting first. The very first jewel to aim for should be Clear mind though. 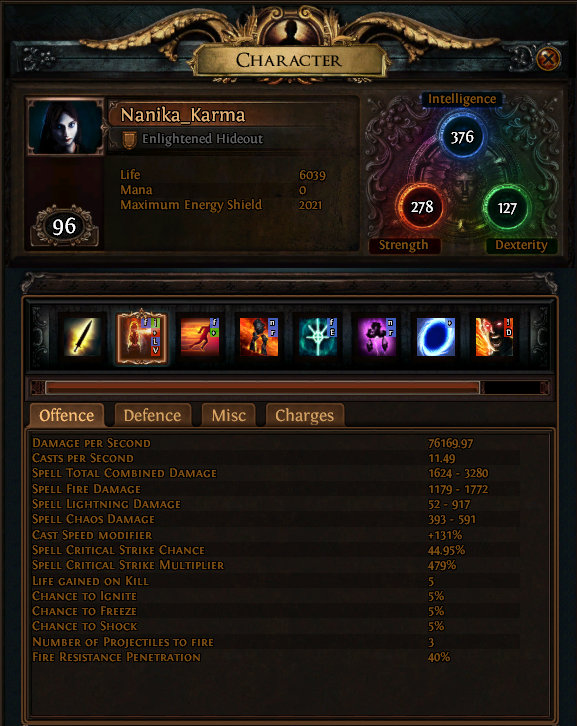 Spelldamage, Cast speed, Attack and cast speed, Crit multi, Spell critical strike chance, Totem Damage, Projectile Damage, Maximum Life %. Another Jewels worth discussing are Spire of the Stone which grants your Totems stun immunity and Rain of Splinters which adds 2 projectiles at the cost of 30% reduced damage in the best case. While Spire of Stone is a niche item and worth considering depending on the Mods of the map you are doing, Rain of Splinters is in my opinion a wasted jewel slot. Yes you gain a minor AoE increase but the opportunity cost is not worth it. The Angle between the projectiles on Flame totem makes it far less potent then e.g. on Incinerate. The Reason Flame totems used GMP before 2.0 was soley for the benefit of shotgunning of all 5 projectiles on a single target. Naturally on your Way to higher levels you will look to Upgrade your Gear and buy decent Rares. Now the most obvious improvements from the base settup are to get a 5link Infernal Mantle or even a 6linked mantle. But what many Players will struggle most with is the correct choice of wands and to an extend the Shield. And here comes a big "Decission" for you to make which depends on a couple of factors, but boils down to the basic Question: Where do I get Projectile speed from? In the Beginning of the Build I suggested to go for Facebreakers as an Easy Damage Option for 60% crit multi if your defense allows it. But this is in the big Picture not the deciding factor. How good your damage will be is mostly based on how much of a good wand or 2 you can find. And here comes the question "Where do I get projectile speed from?" into play. You have the Option to look for Wands with 35% + proj speed. Usually you can find those wands for cheaper prices with good stats if you Don't look for high spell damage rolls on them. Your Goal in this Route is to find A wand with stats like this e.g. It might take time and cutting back on maybe a 3-mod wand first before searching for 4 mod wands with open prefixes but in the long run It should turn out very beneficial to your currency levels. Shields in the THEME of this one will be your go-to Defense choice. You dont pick a shield for its exceptional damage, you want the most defense for your buck because you want to reach high EHP value ,with a close to 3:1 ratio of Total Life: Total ES. This is an Issue and noticable. Its not pretty, but its efficient currency wise. Remember your Karui ward from before? Consider using it if you feel neccesary it in this settup. I Refer to This settup the Facebreaker Route of gearing. Not all is grim though, Going for Facebreakers gives you an easy target of corruptions for small amounts of currency. Just one example of what to utilize. Naturally only having 1 Curse allowed per Target would require to get +1 curse from Somewhere. Or tempt your luck and patiance by corrupting a mass amount of Karui wards for +1 Curse. Because I dont have another pair right now, please keep in mind that this is a legacy version. Maligaros Viruosity rolls only up to 36% crit multi in Challange Leagues. If you dissect the stats and compare them to Facebreakers you will see that you compare 24% crit multi more on facebreakers vs 50% crit chance on Maligaros. This is for what its worth equal in value when it comes getting those stats with passive points. So to make use of the dexterity you SHOULD use Faster projectiles as a gem to be stat wise efficient. This allows you to Utilize wands now WITHOUT proj speed. A new market of potential Wand choices opens up in this Route. Open Prefix for Spell damage craft. In this settup you PROBABLY wont go for a dual curse settup because its to hard to aquire enough currency to mass corrupt decent amulets+ Maligaros. BUT this Route opens up Higher overall damage in the lategame. Bottom Line: Both routes work and have its own advantages and disadvantages. In the Facebreaker settup without Projectiles speed gem you will make use of Increased critical Damage for the 6link. Empower is a Powerfull gem, but it takes a lot to make it actually worth it. Personally Im using it in a +1 gem Corrupted Infernal mantle with empower lvl 4. In this settup its by far the strongest gem after Firepen. But this is an endgame scenario. Untill you have a lvl 4 Empower or a lvl 3 Empower and a 6link +1 corrupted mantle, I suggest to not bother with it. Added Chaos is more then fine for damage substitution. I highly suggest to use Added Lightning in any case because of the Freeze/shatter effect with Three dragons. Its another layer of defense, and as of 2.0 Added lightning was buffed a lot, so in terms of raw damage is roughly only 5-10% weaker then added chaos. Enhance isnt neccesary at all, but as you will have a 3link Option its something you can throw in if you find one yourself or for cheap. Lightning warp as of know is not properly fixed in its way it works on high cast speed/high Skill durations reduction. Feel free to use it at your own preference. Cant Beat assasins Mark. 9% Crit and More Crit damage multiplier are just to tasty. To make them more durable. You can utilize 1 4link for this if you want. Vaal skills cant be triggered by gems like CWDT so you can still make use of it at your own decission when to use it. This will leave you 1 4link Open. to charge up faster and safer. Personally I dont recommend going the Power Charge route, as you lose out life from your Ring slot and consistency of damage. As a player you have a Recource that is Attention/Concentration. You spend this resource to gain power charges. In a Build that doesnt offer many layers of defense, kiting, moving and paying attention are real Values that provide your safety beside your Build and gear. I dont consider it worth it spending this resource on gaining damage over spending it on making sure to survive. This Is MY opinion and if you disagree, feel free to use one of the ways provided to generate Power charges, and make adjustments to the tree to gain up to 7 Power charges. I am totally aware that this is the endgame settup. Consider this the "Sky" to aim for. Yes there is legacy gear on this build. In total it amounts to about ~ 40 Crit Multi not longer available in Challange leagues. Everything else is technically available and only a Matter of your personal choice of how much currency/time you want to invest. I Highly recommend getting A Taste of Hate at some point in time as a Granite Replacement. Due to the way Armour Works in PoE A granite only gives you so much protection. Assess your currency status and consider this an upgrade when possibe. Hallowed Flasks are used on Purpose due to the fast consumption rate. The Diamond Flasks is something I recommend atleast trying once for every crit Flame totem build. Lucky means that every attack/spell that can crit, rolls 2 times on whether it crits or not, and the better outcome is chosen. At 40% crit chance it will give you on average 24% extra crit chance to a total of 64% crit chance. Its the highest Dps a flask can give you in this game, for casters atleast. Crit Flame totem has one of the unique advantages that it casts/attacks a Very High amount of spells per second, this allows Diamond flasks short duration of 4.2 seconds be enough to average out enough casts that will crit and because of it. Use it on conjuction with vaal haste to destroy bosses in seconds. Flame Golem adds about 2k~ dps give or take. 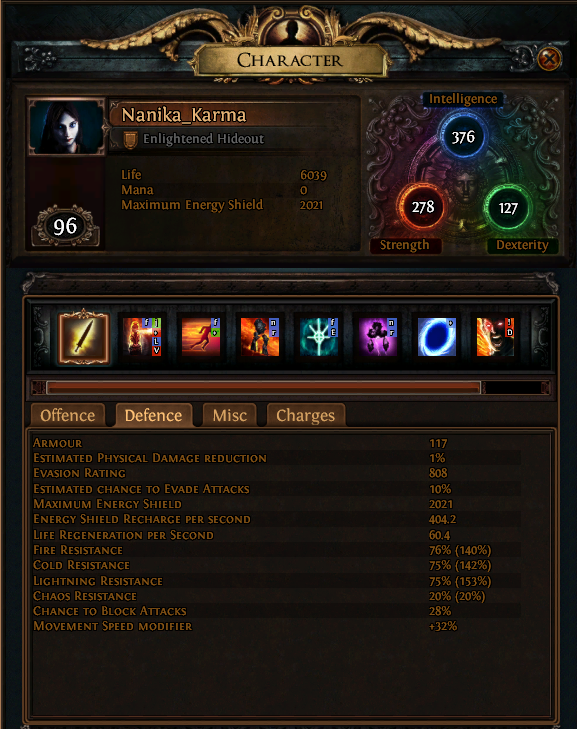 Subtract some base stats from levels and minor gear power adjustments e.g. from rings, you can expect about 15k dps on a 5link with about 6k Effective life. Please take my uber run with a Grain of salt. Recording anxiety is a thing and ive done it better before BUT it is undisputable that Flame totems are NOT optimal for Uber runs. This is merely a showcase that its possible to do reasonably consistent without wasting sets if you play properly. All of my Videos are runs in gear that is what most people would consider "Endgame"
Whereas in the dual wand settup I scratched at 80k+ with wands that i payed 8c and 5c respectively for. 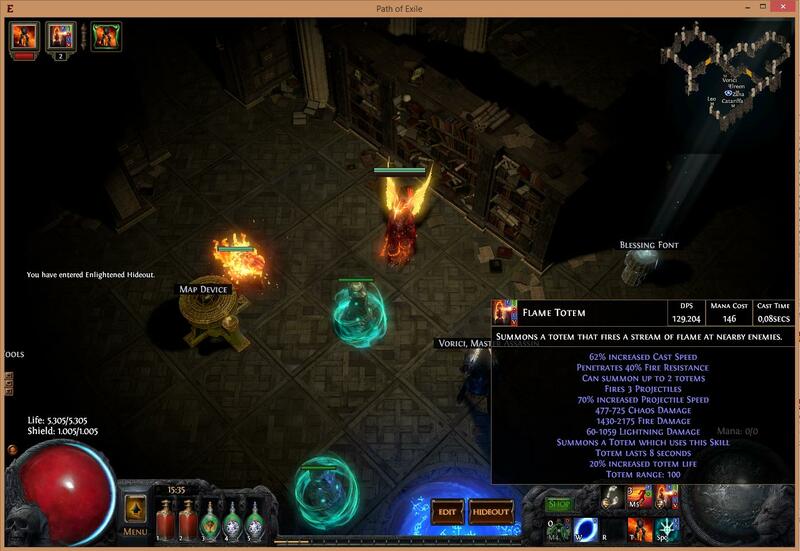 Obviously I managed to get a good deal and aquired a 6link Mantle aswell but this is the Reality of Crit flame totems. With the Right shopping strategies its possible to spend small amounts of currency to gain big Gear Improvements. Naturally I hope that trough the Leveling process that I tried to provide a Guideline for you will see that Crit Flame totems is not something that requires insane amounts of currency to be good. So In the End, Is Flame totem better then Incinerate Totems? Personally I really dislike the current Situation in the community that totally ridicules Flame totems power in the lategame. This is one Reason I wrote the guide. But Also this Guide is meant to highlight the Power of Flame totems Compared to Incinerate Totems. -Doesnt lose 1 Link to spell totem and gains one extra Jewel slot that will be usually used for Rain of Splinters in the incinerate Settup. (If comparing a 4 stat jewel to a perfect rain of splinters the difference amounts roughly the value of 90% spell damage that you gain by beeing Flame totem). - Freezes/shatters as seperate defense layer and provides Shocks on most targets. -By abandonding scaling through crit it has the mechanic of Stages to have a higher Damage out put in the early stages of the game. But Stage charging mechanic reduces average damage on trash mobs by a little (can be improved through smart placement and kiting). -Low Manacosts: Easy way to sustain the costs without to much hassle, No regen maps are an issue though. -Benefit of Offensive/defensive auras if you dont go Bloodmagic route aswell. But In all honesty, Both incinerate and Flame totems are good. I am not to tell you here that Flame totem is the end all be all choice of Totems. Make A Judgement for yourself to decide what Build You prefer with Your amount of time and effort that you want to spend. I encourage everyone to post Questions And discussion for how to improve the build or the guide in this Thread. For Questions. Please understand though that I cant allways provide you my full attention and if the Question isnt urgent I will try to allways provide an Answer in this thread if it hasnt allready been asked. Seems like a tanky with high dps kinda build but I gotta ask why didn't you get any fire damage nodes? And can you share your 130k dps gear and links? Seems like a tanky with high dps kinda build but I gotta ask why didn't you get any fire damage nodes? In this build you are on a tight budget of Points spent. If you invest in Crit you will notice that Crit nodes usually are the strongest ones, with spell damage right behind it followed by elemental damage and then fire damage. The Reason for this is this: Spell damage affects the whole damage of flame totem when linked with added lightning and e.g. added chaos. After that Elemental damage affects everything beside added chaos. And then Fire damage only applies to the fire damage portion of flame totems, which roughly is "only" 2/3 of your total damage output. So with the nodes beeing less in value they are also harder to reach. Its a matter of Power gained per node and fire nodes rank the lowest for that. I think I posted it in somewhere in the guide but for Visibility I post it here again as long its close to the Original post. Will probably do this for the next 1 month league, will go MF first and then DPS. As I have the same tree on my MF character, I tried to quickly swap gems and gear for DPS to compare with your setup. No surprise, the impact of the Empower 4 in a +1 Gem Infernal Mantle is COLOSSAL. Your wands are really good, with 5 good affixes ! +506 Max Life on gear (with shield), that's really good as well ! Congratulations on maximizing everything like that ! CRIT flame totem can compare with Incinerate for sure, but only the crit version. Incinerate also doesnt lose a gem necessarily either. While Faster Proj is basically a must with flame totems, it isnt with Incinerate. Neither is Rain of splinters, having both is an overkill as well. My Sire of shards totems can cover pretty big areas without any of them just fine. If that doesnt cut it, you could always get proj speed on wands, saving a gem slot / jewel slot. I don't see why Flame totems have it easier in No regen / BM map mods as incinerate cost is far less? Anyways, that's mostly semantics, great job on the build! As a current fire totem player in current league, this looks solid.